You vote, Head-to-Head-The NBA’s best player: Bryant, James, Wade or somebody else? Enough of this fluffy MVP talk. 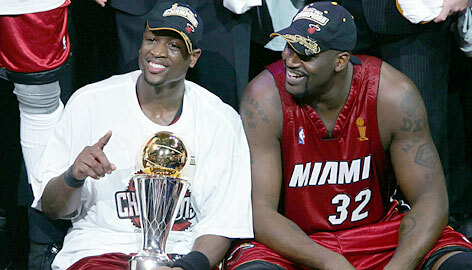 Who’s the NBA’s best player: Kobe Bryant, LeBron James, Dwayne Wade, or someone else? We want you to select the game’s best player. Enter your selection/vote in the comment box. We’ll count your votes and announce the NBA’s best player. Head-to-Head: At HoopsVibe, we’ll continue to debate Nash or Nowitzki for MVP. But now we want you to pick the NBA’s best player. There’s an important distinction here. The NBA’s most valuable player usually isn’t the game’s best player. So forget, for a moment, about the MVP award. What NBA player has the tightest skill set? What NBA player dominates both ends of the floor, imposing their talent and will on opponents? , , and are hoopsvibe’s nominees for best player. Below is the case for each player. You know the deal. Read the evidence and post your vote in the comment box below. 2006-07 season averages: 31.3 points, 6 rebounds, and 5.4 assists per game. 1) He’s the NBA’s best offensive player, leading the league in scoring for the second straight season. Bryant’s offensive repertoire is amazing; he can score in so many different ways. 2) He’s learning to involve teammates. At the beginning of the year, Bryant facilitated the triple-post offense and distributed the ball. 3) He’s an excellent team defender. Bryant rotates on defense, helping his teammates with their check. He’s also an above-average individual defender. 4) 9 games scoring 50 or more points. Enough said. 1) He occasionally struggles with the team concept. Bryant’s made strides in this area, but there’s a belief he still shoots too much. 2006-07 season averages: 28 points, 7 rebounds, and 6 assists per game. 1) At 6-8, 245 pounds, he physically imposes himself on opponents. James is the NBA’s best athlete, combining size, strength, speed, and body control. 2) He’s a brilliant finisher. James is unstoppable when taking the ball to the basket. 3) He’s a phenomenon. James, at just 22-years old, is further along in his development than any player in basketball history. 4) He’s the reincarnation of Oscar Robertson. James could be the first player since Robertson to average a triple-double over an entire season. 5) He’s a superb passer. For such a young player, James has a great knowledge and feel for the game. With his size and athleticism, he can deliver amazing passes through acute angles. 1) He’s shaky from the outside. At times, James’ jumper fails him. More-and-more opposing defenses are backing off the 2-guard and daring him to shoot. 2) He’s apparently hit a plateau. There’s a ‘feeling’ James’ game hasn’t improved from last season. 2006-07 season averages: 28 points, 5 rebounds, and 8 assists per game. 1) He’s reminds some of Michael Jordan. This is the ultimate compliment. Analysts feel Wade, in terms of athleticism, skill set, and body type, is very similar to His Airness. 2) He’s efficient in how he gets his points. Wade averages 28 points per game without taking a lot of shot attempts. Flash scores by getting to the line and shooting a high percentage. 3) He does a great job involving his teammates in the offense. Wade’s an unselfish star, dropping 8 dimes per game. 4) He’s a solid individual and team defender. Wade’s quickness allows him to match-up against his own check, while also helping teammates. 5) Did you see last year’s playoffs? Wade’s a clutch performer. 1) He’s missed games. Wade’s all-out style leaves him vulnerable to injuries. You decide the winner. Post your vote in the comment box below. HoopsVibe.com will tally the votes and announce the NBA’s best player. Later this week, you can logon to NBAblog.hoopsvibe.com for an opportunity to vote on the rest of the NBA awards.